Coronary artery fistula (CAF) is an uncommon cardiac anomaly. Volume overload due to the fistulous connection may cause a marked dilation of the coronary artery, which, ultimately, may lead to aneurysm formation. 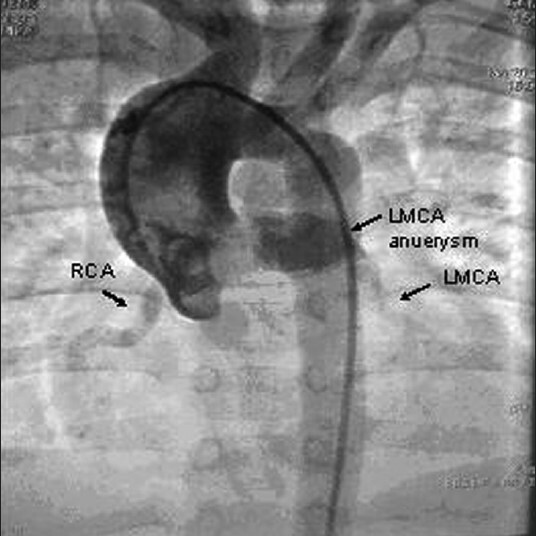 We here report a rare case of a congenital left main coronary artery (LMCA) aneurysm with a coronary arteriovenous fistula to right ventricular outflow tract (RVOT) in a child. A 4-year-old boy presented with complaints of repeated respiratory tract infections since 3 months of age and failure to thrive. He was suspected to have congenital heart disease and referred for evaluation. On general examination, pulse rate was 90 per minute. Cardiovascular examination revealed normal heart sounds and a continuous murmur in the left third intercostal space in the parasternal area. Electrocardiogram (ECG) showed normal sinus rhythm, an axis of +80°, with normal transition and normal ventricular forces. Normal cardiothoracic ratio and normal lung vascularity was seen on the chest X-ray. Echocardiography showed dilation of the LMCA with flow into the RVOT. An initial diagnosis of a left coronary cameral fistula was made. However, the LMCA was hugely dilated, out of proportion to the flow into the RVOT [Figure 1]. A cardiac catheterization was performed to delineate the coronary artery anatomy and pulmonary artery pressures. It showed a giant (14 mm) left coronary artery aneurysm [Figure 2] with a small fistulous connection to the RVOT. 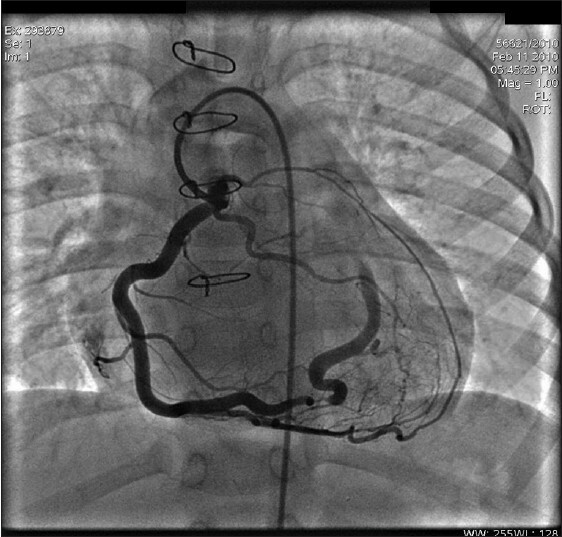 The giant aneurysmal coronary was obstructing the opening of the LMCA and the LMCA was retrogradely filling up from collaterals arising from the right coronary artery [Figure 3]. Pulmonary artery pressures were normal with a Qp:Qs of 1:1. In view of compression of the LMCA origin, the child was referred for open heart surgery. Intraoperative findings were consistent with the echocardiography and angiography evaluation. A surgical repair of the LMCA aneurysm by two-patch technique and plication of the aneurysmal wall was performed. Postoperatively, the child had an uneventful recovery. 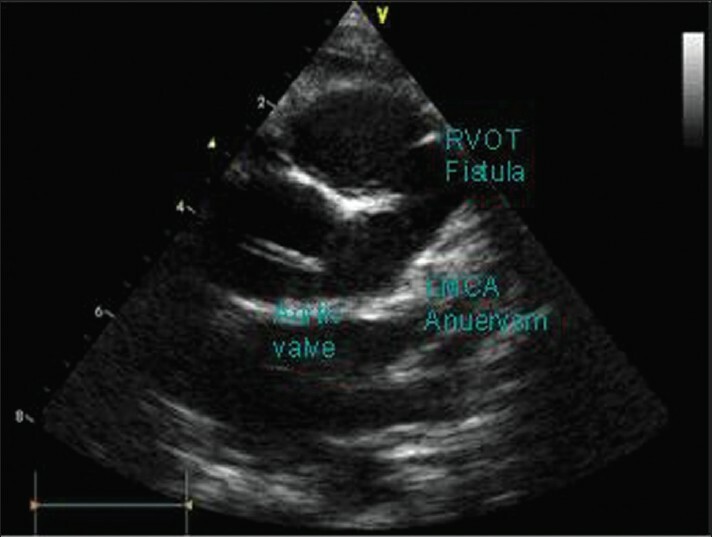 Postoperative echocardiogram showed no residual fistula and normal flow in the LMCA. In our patient, we believe this to be a coronary arteriovenous fistula, with an uncommon presentation of a giant LMCA aneurysm compressing the LMCA origin. Aneurysms are described at both proximal and distal ends of fistulae. A detailed history did not reveal any clinical features of Kawasaki disease such as fever, mucocutaneous involvement, or lymphadenopathy. In the absence of historical and laboratory markers, Kawasaki (complete and incomplete) was ruled out. To the best of our knowledge, congenital aneurysm as large as this one has not been reported in children previously. Pericardial tamponade caused by rupture of aneurysm and myocardial ischemia are the most common complications of coronary aneurysms. Because of the rarity of LMCA aneurysms, it is difficult to standardize treatment. Apart from conservative treatment to prevent thromboembolic complications with anticoagulants and antiplatelet drugs, surgical treatment is most widely used to avoid complications (extension, thrombosis, rupture and coronary embolization). Surgical technique should meet two objectives: Interruption of the fistula and prevention of future complications related to the aneurysm, without compromising normal coronary blood flow. Some of the modalities of treatment for such congenital anomalies as in this patient reported include: Simple intracardiac closure of the CAF, leaving the aneurysm untouched (four patients), three with no reported complications. However, one succumbed to a fatal rupture of the aneurysm 6 weeks following surgery. The second technique used in two cases was the proximal ligation of the aneurysmal coronary artery, associated with the closure of the fistula. A non-fatal postoperative lateral myocardial infarction was noted in one case. The third treatment modality was transcatheter embolization of the CAF, considered as an alternative to surgical closure, reported in one adult  and three children,  with complete closure of the fistula and no complications related to the aneurysm. However, aneurysms in these cases were not as large as in our patient. This case report is the largest congenital aneurysm of the LMCA associated with a CAF reported in the literature in children. Obstruction to coronary flow due to aneurysm was unusual in our case, which required surgical intervention. 1. Said SA, el Gamal MI. Coronary angiographic morphology of congenital coronary arteriovenous fistulas in adults: Report of four new cases and review of angiograms of fifteen reported cases. Cathet Cardiovasc Diagn 1995;35:29-35. 2. Urrutia-S CO, Falaschi G, Ott DA, Cooley DA. Surgical management of 56 patients with congenital coronary artery fistulas. Ann Thorac Surg 1983;35:300-7. 3. Krishnamoorthy KM, Rao S. Saccular aneurysm of congenital coronary arteriovenous fistula. Interact Cardiovasc Thorac Surg 2003;2:295-7. 4. Daoud AS, Pankin D, Tulgan H, Florentin RA. Aneurysms of the coronary artery. Report of ten cases and review of the literature. Am J Cardiol 1963;11:228-37. 5. Lenihan DJ, Zeman HS, Collins GJ. Left main coronary artery aneurysm in association with severe atherosclerosis: A case report and review of the literature. Cathet Cardiovasc Diagn 1991;23:28-31. 6. Darwazah AK, Hussein IH, Hawari MH. Congenital circumflex coronary arteriovenous fistula with aneurysmal termination in the pulmonary artery. Tex Heart Inst J 2005;32:56-9; Discussion 58-9. 7. Phillips WS, Cooley DA. Successful repair of a massive coronary arteriovenous fistula in a 68-year-old man. Ann Thorac Surg 1996;61:984-6. 8. Nakahira A, Sasaki Y, Hirai H, Fukui T, Motoki M, Takahashi Y, et al. Rupture of aneurysmal circumflex coronary artery into the left atrium after ligation of its arteriovenous fistula. Circ J 2007;71:1996-8. 9. Kalangos A, Karaca A, Cikirikcioglu M, Vala D, Didier D. Aneurysmal circumflex coronary artery with fistulous connection to the coronary sinus. J Thorac Cardiovasc Surg 2005;130:580-1. 10. Perry SB, Rome J, Keane JF, Baim DS, Lock JE. Transcatheter closure of coronary artery fistulas. J Am Coll Cardiol 1992;20:205-9.